Toronto Stump Removal and its sister company Brampton Stump Removal provide expert tree stump removal services in Toronto, Mississauga, Brampton, Oakville, Burlington, Milton, Scarborough and more GTA locations. We provide a quality service for an affordable price. Looking to remove that unsightly stump and improve the look and function of your yard? If so, you have come to the right place. Call us today and have one of our stump removal experts come to your home or place of business to assist you with all your stump removal needs! Toronto Stump Removal is a business specializing in the removal of tree stumps. Stump removal is what we do full time and what we are passionate about. With thousands of stumps removed, we are the experts and no job will "stump" us! Our experienced and knowledgeable team is committed to our customers. Our customer service is second to none! Call us and we will explain in detail the process involved in the removal of a tree stump and answer any questions you might have regarding your specific situation. Measure your stump before you call us (measure straight across at the widest part) and we will provide you with an estimate right over the phone. We will complete the job in a timely and an efficient manner and deliver results that will meet or exceed your expectations. Professional, reliable and fast, Toronto Stump Removal will take care of all your stump removal needs for the best price! We are committed to our customers and offer *Best Job - Best Price* guarantee in the Greater Toronto Area. Professional, reliable and fast, we will take care of all your stump removal needs for the best price! Toronto Stump Removal provides quality stump removal for the best price in the GTA! Our top of the line machinery grinds the tree stumps 6 - 8 inches below grade and is small enough to fit through a standard gate and access almost anywhere on your property. Our compact, lightweight stump grinders will do the job in a tight space (near a fence, close to the house or behind a shed) in a fast and an efficient manner without causing any damage to your yard or the existing landscape. Stump grinding is the most economical way to get rid of a tree stump. Once the stump is ground down, we fill the hole left behind with the wood shavings to decompose in the ground. Grinding is also the safest and the most natural way to rid you of that pesky tree stump with no chemicals or other elements to upset nature. After a tree is cut down, you are left with an eye sore of the tree stump. The removal of the stump will ensure that the roots of the tree will not continue to grow and will rid your yard of pest and decay that a stump gets over time. Removing that unsightly stump will improve the look of your landscape and remove tripping hazards for you and your family. You will have an easier time cutting your grass and be able to put down sod, or plant flowers where the stump used to be thereby beautifying your yard. To re-claim a wasted area on your property as usable land which could be utilized as an extension of your outdoor living space or give your children more room to run and play. You can also use it to garden, landscape, or build on. To prevent the roots - which stay alive long after the tree is cut down - to spread and crack any paved area in the vicinity of the stump. The way we go about removing a tree stump is by a process called “stump grinding”. We use top-of-the-line stump grinders which basically “chew up” the tree stump and transform it into a pile of wood chips. The wood chips are then used to fill in the empty hole where the stump used to be. Our equipment is compact and light-weight and will not damage your property in any way. Stump grinding is the fastest, safest and the most ecological way to remove a stump. A stump grinder or stump cutter is a power tool or equipment attachment that removes tree stumps by means of a rotating a cutting disk that chips away the wood. A typical stump grinder incorporates a cutter wheel with fixed carbide teeth. The cutter wheel movements are controlled by hydraulic cylinders to push the cutter wheel teeth laterally through the stump and raise and lower the cutter wheel. Because of its compact size, using a stump grinder is a fast, cost effective, and environmentally friendly way to remove that unwanted tree stump from your lawn or yard without causing any damage to the landscape surrounding it. Most of the stumps removed by Toronto Stump Removal are left behind by the Ash Tree. What does an Ash Tree Look Like? 2. 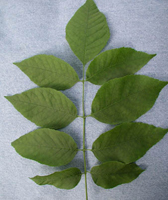 It has compound leaves with 5-11 leaflets (depending on the species of ash). Leaflets are moderately toothed and may be stalked or sessile. 3. In winter: first look for the opposite branching pattern and stout twigs of ash. Small branches grow off larger branches opposite one another. Likewise, buds and leaf scars are opposite one another on twigs. Next, Ash trees have many small dots (vascular bundles) on their leaf scars, forming a semi-circle or crescent pattern. And, white and green ashes have thick, diamond-patterned bark, while black ash bark is thin, ashy-gray, and scaly. Emerald Ash Borer is a forest pest native to Asia that has killed millions of Ash trees in southwestern Ontario, and the Great Lakes States. Due to its major economic and environmental threat, the Canadian Food Inspection Agency has prohibited the movement of firewood and any material made from Ash trees outside of designated areas under an Infested Places Order. The Emerald Ash Borer attacks both healthy and stressed Ash trees when its larvae tunnel through the tree's vascular system which delivers water, nutrients and sugars throughout the tree. Emerald Ash Borer will only travel a few kilometers per year on its own; however it can be easily dispersed long distances by people moving infested materials, such as firewood, logs, lumber, and woodchips. Emerald Ash Borer was first discovered in North America in 2002. It is thought to have been shipped to Canada in untreated wooden packaging materials. The range of Emerald Ash Borer in Ontario is rapidly expanding through the movement of infested materials. For an up to date range map, consult with the Canadian Food Inspection Agency. Attacking both stressed and healthy Ash trees. No known natural enemies to control the population or spread. Once infested, mortality of Ash trees is nearly 100%. Loss of habitat and food for other species. Extremely harmful to urban and rural biodiversity. Loss of valuable timber that is used for furniture, building and recreational products. Learn how to identify adult Emerald Ash Borer and what infested trees look like, as well as which host trees they target. Don't move infested wood material from the regulated zone to new areas; this includes all firewood, trees, logs, lumber, wood or bark chips. Firewood should always be obtained locally and burned on site. If you see Emerald Ash Borer or signs of infestation, call the Ontario Ministry of Natural Resources at 1-800-667-1940 or the Canadian Food Inspection Agency at 1-800-442-2342. Content copyright . Torontor Stump Removal. All rights reserved.